Now into its ninth year, the event brings the total charity contribution from the Fernox golf days alone to over £81,850. This year’s Fernox Charity Golf Day welcomed over 70 heating and plumbing industry professionals to the fairways and greens, to raise money for Shooting Star Chase, a leading children’s hospice charity that provides care to babies, children and young people with life-limiting conditions, and their families, within London and Surrey. The event included mini competitions during the day, with players having the chance to try their luck and ‘Beat the Pro’ on the 16th hole. Colin Willis claimed first place in the overall singles competition and Sarah Bailey won the individual ‘Nearest the Pin’ event. This was followed by the golfers enjoying a luxury three-course meal, whilst continuing to give generously to the raffle and auction, capping off an incredible day of fundraising. 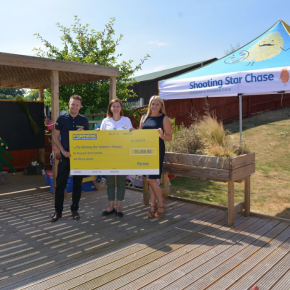 Andy Glaister, National Accounts Manager at Fernox, spoke of his delight at the day’s success: “We are thrilled with the success of this year’s charity golf day.